The Shiba Inu is the smallest of the six original and distinct breeds of dog from Japan. 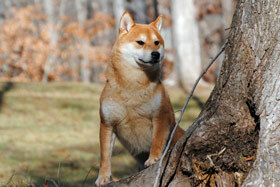 A small, agile dog that copes well with mountainous terrain, the Shiba Inu was originally bred for hunting. It is similar in appearance to the Akita, though much smaller in stature. The Shiba Inu nearly became extinct in the latter phase of World War II, with all subsequent dogs bred from only three surviving bloodlines known as the San'in, Mino, and Shinshu. "Inu" is the Japanese word for dog, but the origins of the "Shiba" prefix are less clear. The word shiba usually refers to a type of red shrub. This leads some to believe that the Shiba was named with this in mind, either because the dogs were used to hunt in wild shrubs, or because the most common colour of the Shiba Inu is a red color similar to that of the shrubs. However, in old Japanese, the word shiba also had the meaning of "small", thus this might be a reference to the dog's small size. The Shiba Inu is sometimes translated as "Little Brushwood Dog". Recent DNA analysis confirms that this is one of the oldest and most "primitive" dog breeds dating back to the third century B.C. Originally, the Shiba Inu was bred to hunt and flush small game. However, it is now primarily kept as a pet both in Japan and Abroad. Epidemic! In 1936, the Shiba Inu was declared a natural treasure of Japan through the Cultural Properties Act. Despite efforts to preserve the breed, the Shiba nearly became extinct during World War II due to a combination of bombing raids and a post-war distemper All subsequent dogs were bred from the only three surviving bloodlines, known as the San'in, Mino, and Shinshu.In 1954, an armed service family brought the first Shiba Inu to America. In 1979, the first recorded litter was born in the United States. The Shiba was recognized by the American Kennel Club in 1992 and added to the AKC Non-Sporting Group in 1993. Like the other native japanese dog breeds they were bred for hunting by ancient hunters of Japan, called matagi and were believed to have special characteristics associated with the concepts of spirit, obedience, loyalty and bravery and their temperaments are always calm and considerate, with great dignity. Their eyes tend to be triangular and recessed, "suggesting the burning spirit within." The Shiba is an agile dog that copes well with mountainous terrain, its original habitat, were it was used on small game and small ground-breeding birds. It is fiercely independent and highly intelligent. Fanciers of the breed compare him to a cat. A relatively healthy breed, the Shiba is nonetheless subject to genetic abnormalities and diseases that affect other breeds and mixes. Hip dysplasia, patellar luxation (slipping of the kneecap), and eye problems affect the breed, so potential Shiba owners should make sure to buy from breeders who do the appropriate screening in attempts to minimize these problems. Like all double-coated breeds, Shibas shed. Grooming helps, but it's almost impossible to eliminate the fluffs of soft undercoat that float around the house during the biennial shed. Shibas can spend a lot of time outdoors in moderate and cold climates, but they need a leash if they are not confined in a fenced yard, and they need obedience training to help overcome their attitude that 'what's mine is mine and what's yours is negotiable.' Individual dogs may be able to romp in public (fenced) dog parks, but some Shibas are dog aggressive and should not be allowed off leash when other dogs are around. Some Shibas don't take kindly to training, especially when expected to walk on a leash or come when called. Some Shibas actually scream their displeasure at the indignity of it all. Equipment in a Shiba's home should also include an exercise pen and a dog crate, for the breed will take liberties if not supervised. He'll want to sleep in your bed, sit on your sofa, and sample your dinner if allowed to do so. Although small, he definitely needs a firm hand; if you can't deal with mischief and stubbornness, think about a different breed. Shibas like children if they are raised with considerate children, but they have no tolerance for children who tease or mishandle them. The Shiba is a fastidious breed and feels the need to maintain themselves in a clean state. They can often be seen licking their paws and legs much like a cat. They generally go out of their way to keep their coats clean, and while walking will avoid stepping in puddles, mud and dirt. Because of their fastidious nature, the Shiba puppy is easy to housebreak and in many cases will housebreak themselves. Having their owner simply place them outside after meal times and naps is generally enough to teach the Shiba the appropriate method of toileting. A distinguishing characteristic of the breed is the so-called "shiba scream". When sufficiently provoked or unhappy, the dog will produce a loud, high pitched scream. This can occur when attempting to handle the dog in a way that it deems unacceptable.